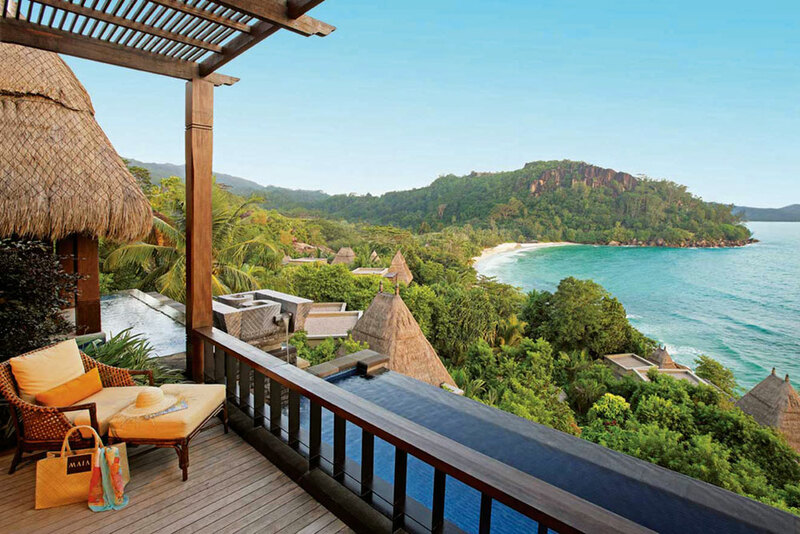 Maia Luxury Resort and Spa, Seychelles. The island country of Seychelles has long been a reverred honeymoon destination – and this glamorous hideaway may just be the cherry on top. No surprises the Seychelles is a renowned honeymoon destination; turquoise blue waters, lush mountain landscapes and white sandy beaches make it pretty hard to beat. The island country – which was made even more famous by the arrival of the latest British Royal honeymooners, Will and Kate – spans an archipelago of 115 islands off the coast of Africa. Located on the largest island of the group, Mahe, Maia Luxury Resort and Spa offers the perfect romantic escape for any loved-up couple. The 36 villas are privately scattered along the luscious green island peninsula. Some of the villas are perched high amongst the beautiful gardens, with spectacular 180 degree views of the Indian Ocean, and others right down on the private beach where guests are close enough to hear the waves lapping almost at their doors. Each villa boasts its own private infinity pool and an outdoor spa plus a personal butler to cater to guests’ every whim, so that long lazy days in the villa need not be interrupted at all (wink, wink). Romance aside; this would make an ideal location for a James Bond movie. It’s easy to play the part when sipping a Martini made by your personal butler in such lavish and exotic surroundings. When you do step out to sate your appetite, the fine dining restaurant Tec Tec offers Mediterranean cuisine with an Asian Creole accent. For privacy, meals can be delivered, with silver service, to a secluded location anywhere in the resort. And for cravings not on the menu, the chefs are more than happy to accept any bespoke menu requests. Feeling slightly bemused by the lavishness? Well that’s just the beginning; guests can also take a ride in the private helicopter, or have a massage at one of the outdoor spa treatment rooms by trained Balinese massage therapists. Perhaps the pampering overdose will promote a desire for adventure – well the resort caters for that too with kayaking, hiking, fishing and snorkelling. Of course luxury like this doesn’t come cheap. The daily rate is from $2243 for an ocean view villa, including breakfast (well, you would hope so).